Present an elegant gift that is sure to please all. 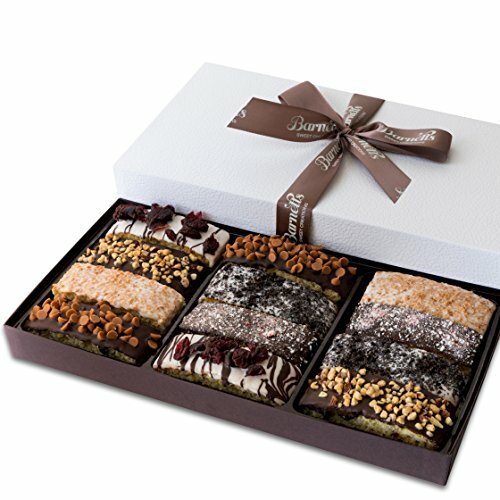 Whether you're conveying a gesture of gratitude, sharing a thoughtful wish of remembrance, or simply your own deserving palette, sending a Barnetts Fine Biscotti Gift Box is the best way you can express your feelings with all your clients, colleagues, customers and those very special acquaintances. Our classy gift box includes 12 gourmet, chocolate and fruit/nut topped biscotti handmade from premium ingredients, delicious down to the last crumb. Unlike so many other generic gift baskets, this is a gift that is sure to be thoroughly enjoyed and well remembered. This is the perfect gift - delightful inside and out. Our gourmet sample box containing twelve delectable biscotti two of each topped in its own distinctive flavor. Handcrafted with care, from only premium and natural ingredients. No additives, preservatives or transfat in any of our biscotti. Made fresh for each order, and delivered directly from our bakeshop for your delight. If you have any questions about this product by Barnnets Cookie GIft Baskets, contact us by completing and submitting the form below. If you are looking for a specif part number, please include it with your message.